At its Build Developer Conference in San Francisco today, Microsoft provided some new details on its HoloLens virtual reality device it announced back in January. HoloLens is a head-mounted, holographic computer with a depth camera that provides a mixed-reality experience for a range of applications. I briefly covered the HoloLens in a previous post and was hoping Microsoft would share more about the unit today. It seems someone in Redmond was listening to my geek prayers. Today Microsoft showed off various HoloLens applications that work with Windows 10 and even one that controls a Raspberry Pi robot. 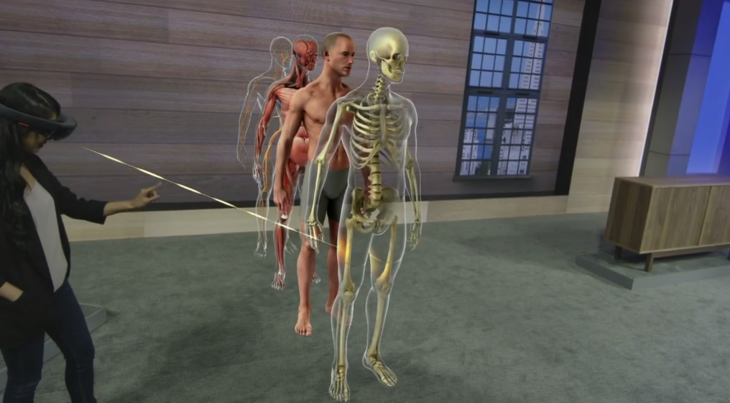 They also announced support of HoloLens by the Unity3D game engine. The Verge has a great recap of the day’s announcements and HoloLens in the video below. Another demonstration today during the Build Conference keynote session showed the integration of HoloLens with Trimble’s SketchUp 3D modeling software and the Trimble Connect collaboration platform. While these applications are still in development, it really gets one thinking about the HoloLens use in built environment related industries. It will be exciting to see what AEC Hackathon hackers create with this device when it is made available to developers. I will be following HoloLen’s development as Microsoft has definitely made this an exciting time for augmented reality.